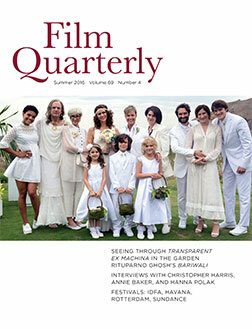 To judge by the critical enthusiasm with which the second season of Amazon Prime’s Transparent (2014–) series has been embraced, Jill Soloway not only has a big trans-affirmative hit on her hands but has succeeded in stimulating a lively conversation about queerness, trans politics, and television representation within the broader society. 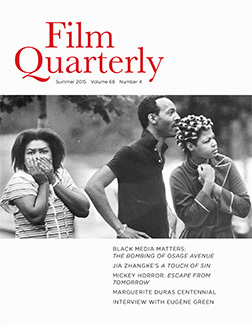 FQ Editor-in-Chief B. Ruby Rich’s roundup of the Summer 2016 issue: Volume 69, Number 4. 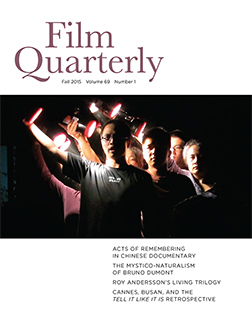 Rich recalls the early years of university-level film history courses, assesses the barrage of industry news that lands on her desk daily, and pays homage to Richard Dyer, who was honored by the Society for Cinema and Media Studies at their annual conference. Dyer’s first published monograph, GAYS AND FILM (1977), came into the world in a vacuum. There was simply no such field. Today, it is difficult to comprehend the force of imagination and courage required to launch such a career at such a time. Forty years ago, a grand ballroom would not have filled with people and applause for a gay scholar; today, it was unremarkable that one did. 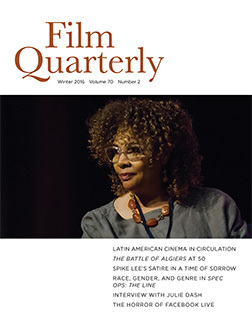 FQ Editor-in-Chief B. Ruby Rich and guest issue editor Natalia Brizuela introduce FQ’s dossier on the work of Brazilian filmmaker Eduardo Coutinho, who died unexpectedly in 2014. Eduardo Coutinho, the greatest documentary filmmaker in the last half-century of Brazilian cinema, is woefully underrecognized in the United States and has not been adequately incorporated into the global history of documentary cinema. 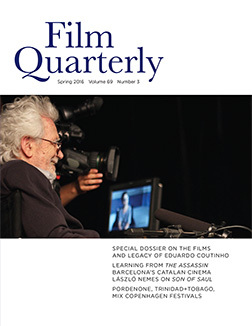 This dossier aims to open up conversations about the work of Coutinho in Anglophone cinema studies, and to encourage more scholarship on the subject. FQ Associate Editor Regina Longo met with Bernie Cook in Washington, DC to speak about his book Flood of Images: Media, Memory, and Hurricane Katrina. The book’s publication marks the 10-year anniversary of the storm and its aftermath. As a native of New Orleans and a media scholar, Cook approaches the subject as both an insider and an outsider. 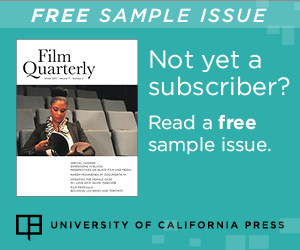 Read the column and then download the free chapter of the book offered here for FQ readers, with special thanks to UT Press. Kathleen McHugh’s essay is accompanied by video clips that can be viewed here. Jane Campion and Jenji Kohan each premiered television series in 2013 that used genre to facilitate pointed interventions in postfeminist representational paradigms. Along with other contemporary female-centered television series, Campion’s Top of the Lake and Kohan’s Orange is the New Black have garnered extensive popular and promotional attention. That discourse, together with commentary regarding Campion and Kohan as feminist auteurs, provides a discursive environment for Top and Orange at odds with much postfeminist female-centered programming that has emerged since Ally McBeal (1997) defined the paradigm. Masculinist bias may explain why made-for-television movies—that most feminine and denigrated of television genres—were never considered “quality” until very recently. This summer, two telefeatures brought quality television’s innovations to small-screen docudrama. Paul Julian Smith on alternate and layered realities in Joss Whedon’s Cabin in the Woods and NBC’s Awake. 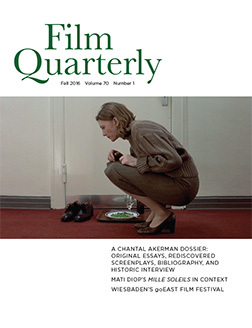 FEATURES: Melancholia and the Comedy of Abandon; The Hunger Games and other Precarious Dystopias; the Arts of Imitation, Information Managers, and Several Sides of Errol Morris. 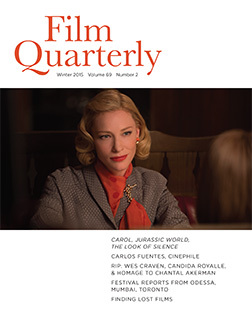 READ: Interview with Manuel Alberto Claro, Paul Julian Smith on Cabin in the Woods, a review of the book Film: A Very Short Introduction, and a tribute to Film Quarterly founding editor Ernest “Chick” Callenbach. A review of the cult British TV show, A Very Peculiar Practice, a black comedy set in a regional university in the Thatcher era.